https://www.youtube.com/watch?v=lWyi5SH7xd8 -- Copy & Paste this Link in your web browser to watch Property VIDEO! Exceptional 1.33-acre lot with views! This property has a rural feel tucked between Carver and South Mountains you enjoy Country living yet only 15 minutes to Shopping; Casinos; the new 202; I-10; Downtown Phoenix and Sky Harbor Airport. Owner has included a $16,000 set of Blueprints to build a Luxury home designed for this lot. Sweeping Mountain Views in every direction. See Downtown Phoenix City Lights from a 2-story home built here. Property surveyed with new corner pins set. 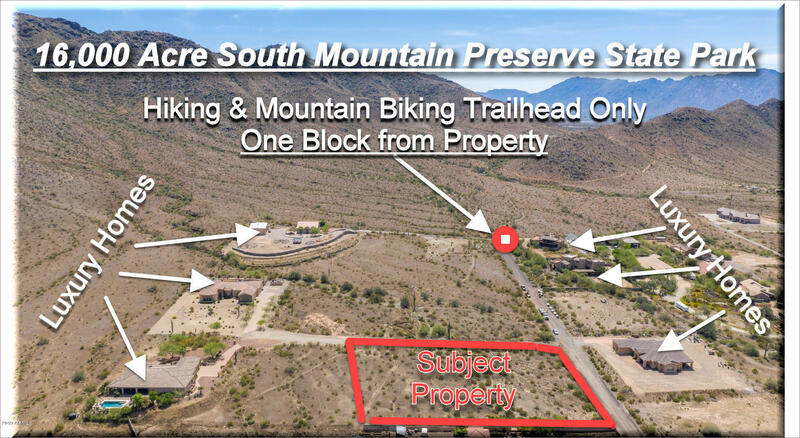 Electric; SRP;, to the property line. Negotiate shared well agreement with neighbors or drill your own well. Well-quote available at $8,950 (2012) for a 350 ft well system. Build your dream home!